I swear I'll stop with the hearts for a while (I'll wit 11 months)... here's a collage of all 28 images I shared this year. Great collage and heart captures. It does get addictive I am still looking for hearts even though I completed the month. Wonderful collage of all your beautiful hearts. 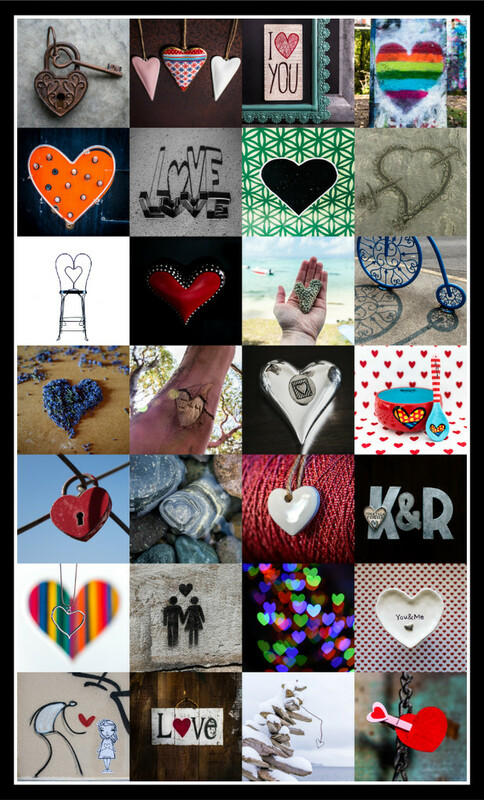 Super month of hearts beautifully presented in your collage ! This looks fantastic! SO enjoyed your heart images! A very heart-felt month! The collage looks great as did each individual shot. Dare I say, I love ❤️ this! Fabulous collage! So many beautiful images! This is so cool - should be framed or printed on acrylic! So cool I love how creative this is! great job kwind! A stunning collage with all your wonderful hearts. Oh well done, they look gorgeous together. fav. Fav! A hearty piece of work! Beautiful collection I love your Februarys fav. What a reward. Perfect for a postcard. So many cute images. It looks fabulous. These are amazing, I would be hard pressed to find more than a handful! To see all of your heart in a collage. awesome. Loved seeing your clever heart images! A great collage of all those beautiful hart pic.`s. Your hearts look terrific together in the collage. A print, perhaps? Poster size? A striking collection! Well done! so many hearts. i like it! A beautiful original heart felt collection! Such a beautiful collage, and on the TT! Oh my!